Doug Smith started his farming career after leaving school in 1963. He spent two years on the 10,000 acre Wairoa Cricklewood Station as head shepherd. After spending some time in Australia and the Far East, Doug came back to the 2000 acre Te Manuiri Station. He married in 1969 and farmed Te Manuiri until 1979, when a serious accident with a young horse meant he had to appoint a manager to Te Manuiri and move to Havelock North. Doug joined Wrightson NMA in April 1980 as a rural real estate agent selling small blocks and orchards and, 12 months later, he moved into selling farms. 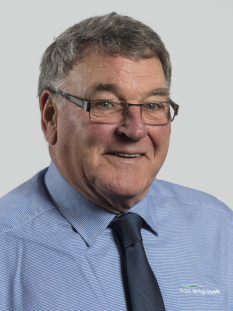 In 1985, he became a field officer responsible for client finance and real estate then was appointed as branch manager of Wrightson Dalgety in Waipukurau. 1990 saw Doug appointed as rural finance manager for the eastern region. In 1994, Doug became an independent rural real estate consultant for Wrightson operating on farms over 40ha in the Hastings region. Throughout his real estate career, Doug has been the number one highest earner in farm sales for the company in the East Coast region (Gisborne to Masterton) and has consistently been in the top 15 highest real estate earners for the company nationally. Along with four others, he has gained the ‘legend status’ award for in excess of $50M turnover in one financial year. Doug has maintained a continued interest in farming since leaving Te Manuiri in 1979. Doug and his wife, Sue have two sons. Their oldest boy, David owns the local community newspaper in Raglan whilst the younger, Andrew now farms Te Manuiri, with Doug being the ‘junior shepherd’ when required. Interests include back country trout fishing and dog trialling—where Doug is a New Zealand Dog Trial Association judge for both Heading and Huntaway events, whilst still enjoying meeting people and the continual challenge of selling property.